United Utilities has called off the hosepipe ban which was due to start in north west England this weekend. The company said slightly cooler temperatures and recent rainfall, along with customer efforts to reduce usage have eased the demand for water and helped reservoir levels. 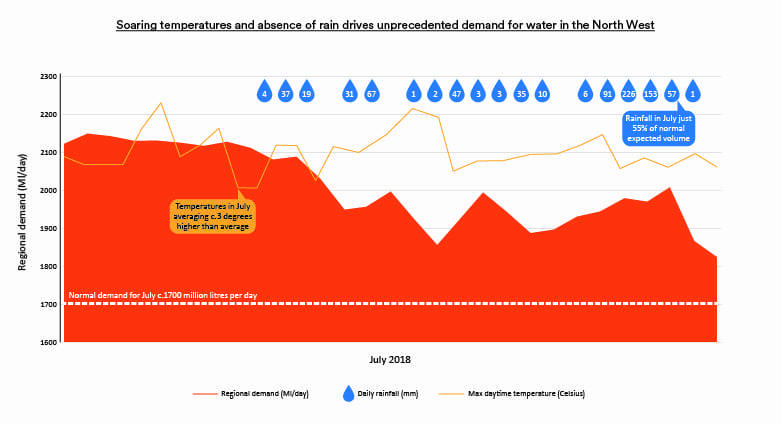 However, it has warned it may need to introduce a temporary use ban at a later stage if the dry weather continues throughout August and beyond. Dr Martin Padley, water services director at United Utilities, said: “We would like to thank all of our customers who have helped in recent weeks by conserving water wherever they can around the home and in the garden. He added: “Given the improved position, helped by recent rainfall, we do not want to inconvenience customers unnecessarily at this time. However, the long-range forecast from the Met Office is one of relatively dry weather into the autumn, so future restrictions are still a possibility if more rain doesn’t arrive. Robert Light, northern chair for the Consumer Council for Water, said: “Consumers deserve great credit for the way they’ve responded to the call to use water wisely and we welcome United Utilities’ decision not to press ahead with restrictions and the inconvenience this would have caused households – but we’re not out of the woods yet. Last month, United Utilities announced plans to implement a hosepipe ban, scheduled to come into force on 5 August. Northern Ireland Water lifted its country-wide hosepipe ban on 19 July, which had been in place since 29 June. United Utilities has also requested permission to abstract more water from three lakes in Cumbria to protect public water supplies. It has submitted drought permit applications to the Environment Agency (EA) and the Department for Environment, Food and Rural Affairs (Defra). A spokesperson for United Utilities, said: “We are continuing to work closely with the EA in monitoring the situation to ensure we have enough water in supply right across the region while balancing the needs of customers, the impact on water sources and the local environment. The EA expects the sector to “step up efforts” to manage supplies, while Michael Gove has challenged water companies to “raise the bar” to tackle leakage.